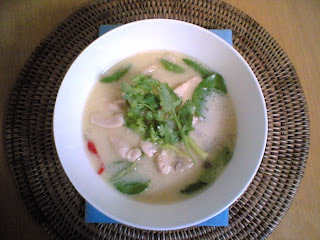 I personally don’t like Coconut Milk but I do like cooking “Tom Kah Gai” from time to time. 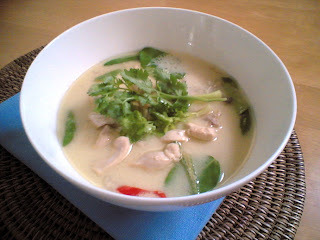 I remember that my mother used to cook a wicked dish of “Tom Kah Gai” when I was young. Now I am not living with my Mum anymore. So, it kind of reminds me of my mother’s cooking. 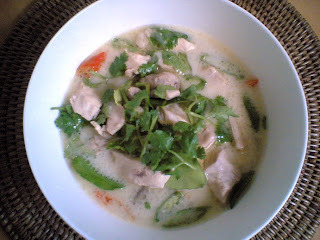 “Tom Kah Gai” looks and sounds pretty much sophisticated. It seems to be difficult but its actually a very easy and simple dish to cook. This looks like some great comfort food/hangover cure. This was soooo good! Thank you very much. Most other recipes call for the coconut milk to be added later on in the recipe, but I think your way really gives the whole thing an excellent flavor. Thanks again!